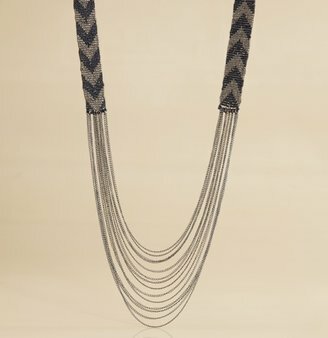 This Fiona Paxton "Coco" Zig-Zag Necklace sells for $338 at Bloomingdales.com. 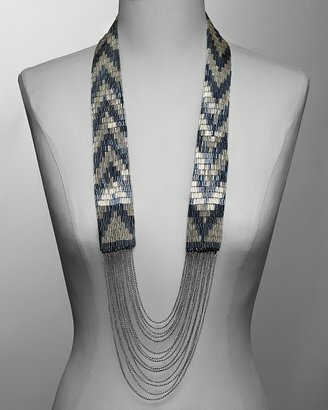 Get the look for less with Martin + Osa's Chevron Seedbead Necklace, on sale for $27.65. Do you think this trend is played out or still "in"? I personally love these types of accessories - big, bold statement necklaces. I think they are a quick and easy way to spice up an ordinary t-shirt and jeans, and really make an outfit stand out. Of course, I'd never pay $300 for one! Fiona Paxton was selling at London Fashion Weekend last week - big chunky necklaces are here for a few more seasons. As Angel above says, fab accessory for basic outfit. I wholeheartedly agree with both comments. Besides, I'm just getting the hang of this trend so it better stick around! I have not seen this on any people on the street yet. i like it! If you have a Von Maur in your area (similar to a Nordstrom) they have these in the juniors section for $16. NastyGal also has similar necklace for only $30! They also have them at Target, although I couldn't find it on their website. I haven't seen it either. I totally love it!! !